The best mobile shopping apps help you in your pursuit of the best products, prices and sales, all with a social and personalized experience. The following are all free to use, easy to navigate, simple to set up and extremely helpful. Avoid trips to the crowded mall or waiting in traffic and shop from your phone instead. The Amazon mobile app has won numerous awards, including the distinctive Webby for Best Mobile App, and is one of the most visited apps in the United States. Amazon's well-designed shopping app is quick, simple, and straightforward. With conveniences such as Amazon Prime, Amazon Pantry, and Amazon Family, you can find virtually anything you are looking for. Amazon also offers daily sales to Prime members, including Gold Box Deals and Deal of the Day, which you can add to your cart with one click. Moreover, Amazon is now attracting designer apparel and accessory makers due to sluggish department store sales. A mobile Amazon user is typically continuously logged in with payment and browsing preferences saved, enabling one-click shopping. Additionally, the app syncs your shopping and wish lists with the website automatically. It also has progressive camera and scanning features that other shopping apps have yet to replicate. If you want to use Amazon Prime, the membership fee is $99 a year or $10.99 per month. If you don't shop enough to take advantage of Prime's extras, like free two-day shipping, the cost may not be worth it. Also, Amazon is an aggressive user of cookies that track users' activities on different websites. Amazon uses this information to send emails and show customized ads based on an individual's search preferences. If you are in search of a handcrafted gift, vintage item, or simply a unique product, chances are, you will find it on Etsy. All Etsy sellers are independent, creative businesses, and Etsy's buyers and sellers are from all over the world. 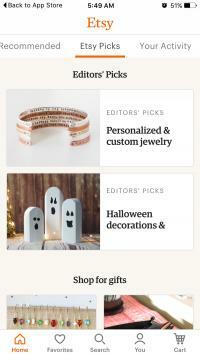 Etsy is one of the most well-designed mobile apps available. Etsy is intuitive and simple to navigate. You do not need an account to browse Etsy, but if you create one you can browse your shopping history and activity feed, engage in conversations with sellers, and purchase items directly from your mobile phone. All users can search by category and read reviews for particular products. Etsy's Favorites feature enables you to create and customize your experience to save sellers and products that are pertinent to you personally. As an added bonus, you are able to search for Sellers nearby, to connect with local shops and potentially eliminate shipping costs. You must read the fine print. Each seller has different policies regarding turn-around time, shipping, and communication. Additionally, customer service is lacking. If a buyer has a complaint or problem with an order from a seller, she must open a case on Etsy to resolve the dispute, and this process is not quick. Winner of the 2015 People's Choice Webby Award, RetailMeNot is one of the world's largest digital coupon marketplaces. The app provides shoppers with coupons and deals from tens of thousands of national retailers and local merchants for products including clothing, entertainment, health and automotive. 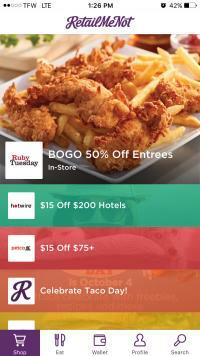 RetailMeNot also includes deals on food and restaurants. 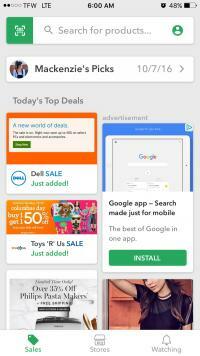 The app allow users to bookmark favorites, search by Today's Hot Deals, and browse categories and deals. You can save deals on your phone or use them immediately, online or in store. They'll even alert you when your coupons are about to expire. This is a great app to use while you are out shopping, to find relevant coupons to use at a store you are currently shopping. 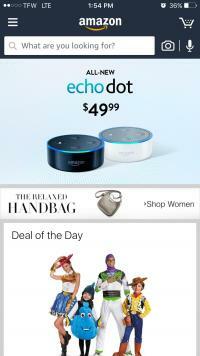 RetailMeNot has endless deals, but they do expire. If a shopper does not browse the app on a regular basis, she is likely to miss out on taking advantage of a deal. Also, while most of RetailMeNot's deals are legitimate, once in a while a coupon or code is deemed invalid at a store or online. Jet, a unique shopping app competing with Amazon, was voted one of the best apps for Android in 2015. Jet utilizes a mix of money-saving techniques to provide prices that are 6-7% less expensive than other online shopping sites. The intuitive app enables shoppers to earn savings for purchasing more than one item together. Discounts are applied to items after they are placed in the cart. 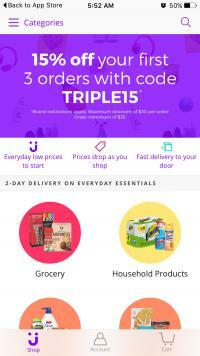 Jet offers free shipping on orders $35 and over. Benefits of Jet also include Android Pay support, one-click re-ordering, and allowing the shopper the opportunity to waive return rights to save more money. The major complaint found in Jet's reviews is the lack of selection. When compared to Amazon, Jet.com offers a mere 31 percent of the 1,600 items compared to Amazon. Zappos, which sells shoes, accessories, handbags, clothing and household goods, is known for its stellar customer service. The mobile version, consistently receiving high ratings from users and editors alike, does not disappoint. Like the main site, Zappos mobile offers free shipping and returns with no minimum purchase, a 365 day return policy, and 24/7 customer support. The clean touch-friendly interface of the mobile app makes it very easy to navigate, including the ability to filter search results, browse by brand and save favorites for later. As an added bonus, the Zappos mobile app offers full support for Apple Pay, making it as convenient as possible to complete your purchase. You can even request a refund through the app. This app is so popular, certain items may go out of stock. ShopSavvy cuts down on shopping stress by finding the best deals in store and online. ShopSavvy, a frequent finalist in CES's Mobile Apps Showdown, allows consumers to scan a product's barcode with a phone camera or search for an item and immediately access a list of all the best prices, online and in-store. ShopSavvy streamlines the shopping experience by providing directions to stores, the option to create a price alert, and the ability to purchase item online. Promotion and sale data is updated daily. With the latest release, permissions require the user to provide a phone number in order to use the app. Also, some users report problems scanning barcodes. Polyvore, consistently ranked 5 stars by users, is THE app for fashion. Polyvore is not a typical shopping app. 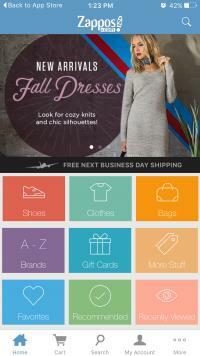 The app enables users to build outfits or rooms online, using products shown on the app. Each "liked" item is logged, style preferences are noted, and choices are saved. Polyvore will then send alerts when those items are on sale at participating stores. The app is stylish, clean and quick. Users can follow fashion lovers, designers, and brands to keep up with the latest creations and with products that they like. 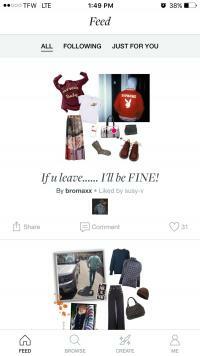 The app also offers lots of style advice and runs contests! The products can be expensive, and often once a shopper receives an alert for an item, the item is already sold out. 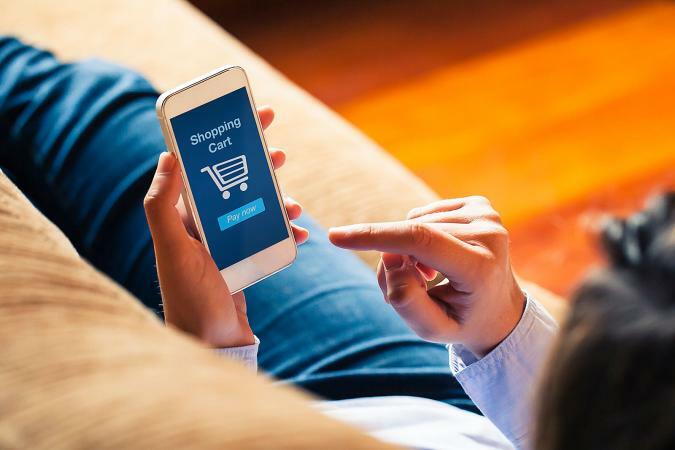 With these seven innovative apps at your fingertips, online shopping on the go will be easier than ever and you will save money too! Download them now to browse for products and to score the best deals, all from the comfort of your couch.